With Christmas just around the corner (in fact as I type this, it is 1 December so we are officially in safe territory to start counting down to Christmas!) its the time we can all start to relax, get festive and start to really enjoy ourselves and have a bit of fun! 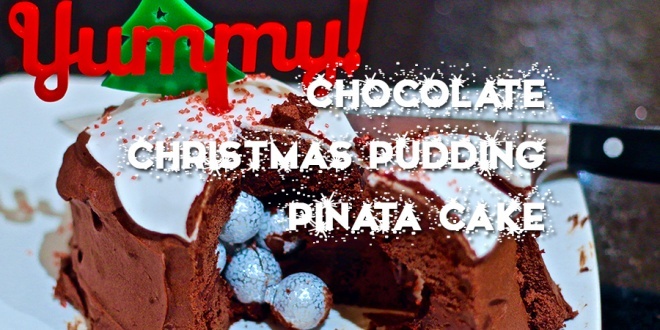 And this chocolate Christmas pudding pinata cake is perfect for that. Made up of 2 small chocolate sponge cakes, with chocolates inside, covered with chocolate icing, white icing, sprinkles galore and a fantastic re-usable Christmas tree cake topper. Here’s the low down on it. Sorry there’s no video because the day we were filming it, it was a complete disaster so I had to make it again later on! From here you can either microwave your cakes (because most cereal bowls aren’t oven proof) or bake free-form in the oven, wrapped up in foil. For the oven: Pre-heat the oven to 170C, grease 2 large sheets of kitchen foil and fold up the sides to create 2 separate bowl shapes of roughly the same size. Pour half your cake batter into each “bowl” and bake for 18-20 minutes. You’ll know it’s done when a toothpick can go in and come out clean. For the microwave: Heavily grease 2 separate sheets of baking paper and line 2 separate cereal bowls with them. Pour half the batter into each one. Microwave each one for 3 minutes and then 1 minute. Use the same toothpick test to check if they’re fully done. 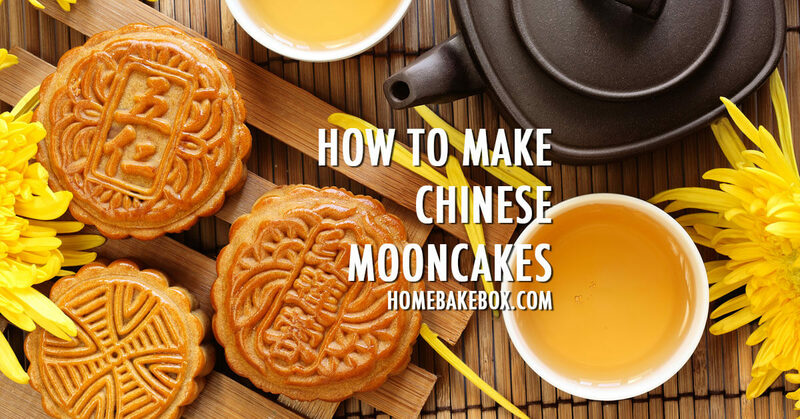 Allow your bowl shaped cakes to cool fully before removing them. Make the chocolate frosting by combining your dry ingredients for the frosting with 150g melted butter and gradually add in 2-3 tbsp milk. Whisk until you have a thickness and consistency that can form stiff peaks. 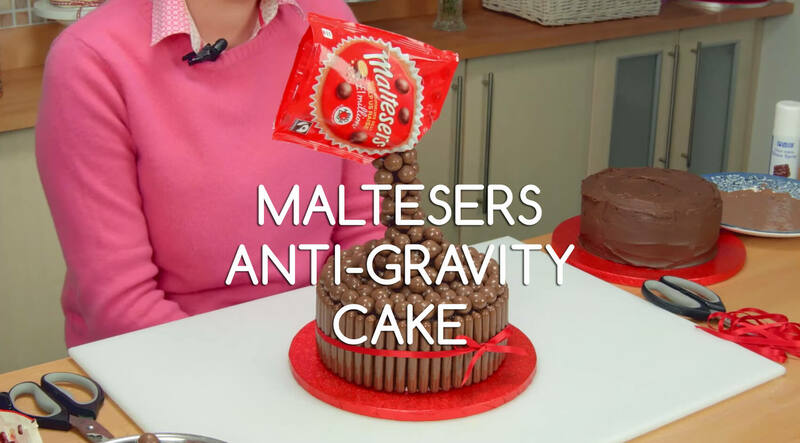 Trim a bit off the bottom of one of your cakes to form a wider base (so it can support the pudding structure without toppling over) then ice the top rim with some of your chocolate icing (enough to make the top layer stick to it). 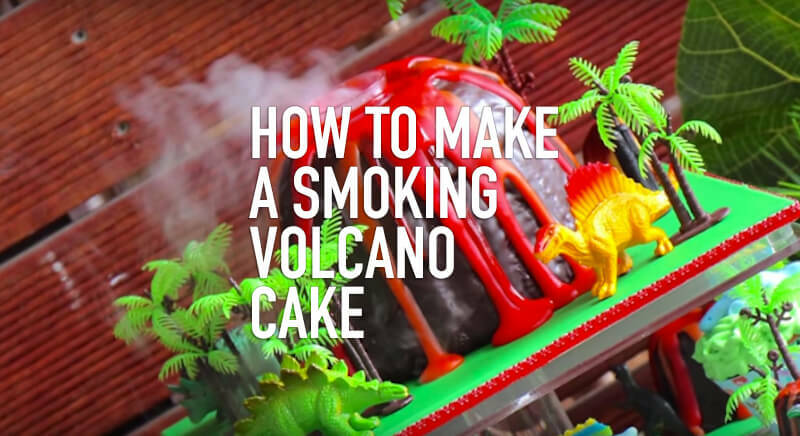 Carefully add your piñata cake filling and then place your second cake layer over the top. If the edges of your cake are slightly mis-matched, you can trim off some of the edges to even it out. Cover your cake with the rest of your chocolate frosting and set in the fridge for 30-40 minutes to allow it to firm up. Roll out your white icing into a wavy circle shape and place it on top of your frosted chocolate Christmas pudding cake. 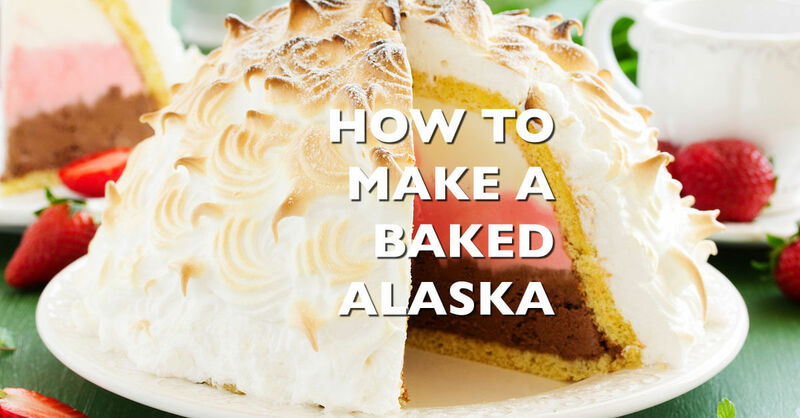 Brush the white icing with a tiny bit of water and gently sprinkle your sprinkles over the top. Finally top the cake off with your cake topper. When you slice it open, the filling should pour it – piñata style. 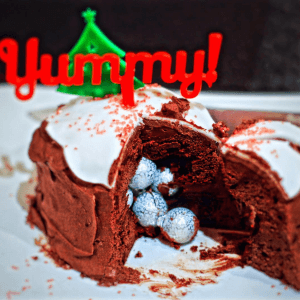 And voila – you have a chocolate Christmas pudding pinata cake! Want everything you need to make this Chocolate Christmas Pudding Pinata Cake delivered directly to you and weighed out perfectly so it’s super easy? We’ve got you covered. 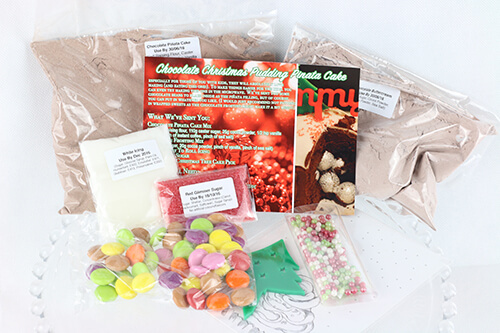 We have got a few of these baking kits in stock for a limited time only. Click here to find out more and get yours today!